Shapes formed of evenly joined squares and cubes are known, respectively, as polyominoes and polycubes. Think of polyominoes as small clusters of giant-sized pixels. The best-known of them are the 12 pentominoes, first named by Solomon Golomb in 1953, when he was just 21 years old, and first published in The American Mathematical Monthly in December 1954. Golomb derived the names for multiple-square combinations ("polyominoes") from the word "dominoes", which are two squares joined. All the possible shapes formed from the same number of squares have their specific ranking name: 3 are trominoes, 4 are tetrominoes (that's the ones in the popular Tetris computer game), 5 are pentominoes, 6 are hexominoes, 7 are heptominoes, 8 are octominoes, etc. Golomb's definitive book, Polyominoes, first published by Scribner's in 1965, was updated and reissued by Princeton University Press in 1994. It is available from Kadon. In 2011 Golomb was awarded the National Science Foundation's National Medal of Science (17:16-18:00) by President Obama. Kadon was happy to present to Dr. Golomb the 2013 Gamepuzzles Annual Pentomino Excellence award on the 60th anniversary of his introducing polyominoes to the world. Enjoy a biographical video about Solomon Golomb on YouTube. And here is a charming interview with Sol. Pentominoes were popularized by Martin Gardner in Scientific American starting in 1957 and were one of the most eagerly pursued subjects through the years. We are honored to be the publishers of two games by Martin Gardner, sold elsewhere on this website: Lewis Carroll's Chess Wordgame and The Game of Solomon. Martin Gardner passed away on May 22, 2010, at age 95, in Norman, Oklahoma. We will continue to celebrate his life and his achievements, which live on after him in countless carriers of his enthusiasm for knowledge through mathematics. An enthusiastic group of Gardner admirers have been honoring him with bi-annual Gatherings since 1994. Martin is cherished in our hearts and minds forever, and now with annual Celebrations of Mind the world over on his birthday, October 21. One pentomino addict was Arthur C. Clarke, who included pentominoes in his 1976 science fiction novel, Imperial Earth, which directly inspired the creation of Kadon Enterprises, Inc., and its flagship product, Quintillions. Clarke had hoped to have pentominoes included in the movie, 2001A Space Odyssey, but chess prevailed. Sir Arthur C. Clarke, one of the greatest minds of all time, died March 18, 2008, at age 90 in Sri Lanka. We mourn his passing but celebrate his life and his gifts to all humanity. We salute him in perpetuity. The Clarke Foundation lives on. Postscript: Sir Arthur's last book, sensitively co-authored by Frederik Pohl and published posthumously, is appropriately titled The Last Theorem, and while it deals with Fermat's math, its proof attributed fictitiously to the novel's young hero, the ultimate theorem the title really means is the Golden Rule, in homage to Clarke's ceaseless vision of peace among all lifekind. And the story towards the end nicely reprises pentominoes and even mentions hexominoes and Martin Gardner. The circle closes. These, then, are the three giants on whose shoulders we stand, the direct line that led to Kate's reading of Clarke's book in 1976, when she became instantly enchanted with the pentominoes' endless appeal. The business was started up in 1979 and incorporated in 1980. In 2004, over a quarter century later, Chasing Vermeer, an art history mystery by Blue Balliett, featured pentominoes in an ingenious plot twist. Here is our review of this book that became an instant bestseller. Blue followed it in 2006 with The Wright 3 (read our review), where the same young heroes pursue a mystery about a Frank Lloyd Wright building. For this book, Kadon awarded Blue Balliett the Gamepuzzles Annual Pentominoes Excellence award for 2006. In her third book, published in 2008, The Calder Game (read our review), Blue Balliett's three young sleuths tackle the puzzle of a vanished sculpture by Alexander Calder, involving mysterious mazes and spooky graveyards in an old English village. An early, and enormously popular, polycube puzzle was the Soma Cube, invented by Piet Hein and mass-marketed by Parker Brothers in plastic in the 1960s and early 1970s. Some wood versions were also made in Europe. While not a complete set of all possible shapes, Soma contained 7 pieces  six of the eight different tetracubes and one of the two tricubes  and formed a 3x3x3 cube and hundreds of other shapes. Here, in the Geocities Archives, is a beautiful website by Dennis Nehen dedicated to Piet Hein's Soma figures, with historical notes and a gallery of shapes. After a number of years off the market, this puzzle has been brought back by ThinkFun, Inc. (formerly Binary Arts) under the name Block by Block, available from Kadon. Various versions of pentominoes have appeared from time to time in several countries, under different names. Kadon's three-dimensional Quintillions® set has been crafted and marketed continuously since 1980. It contains the most extensive documentation for these shapes published anywhere. Kadon's two-dimensional Poly-5 set, with all the polyominoes sized 1 through 5, has been made since 1986. A more recent polyominoes product finding success in world distribution is Blokus (pronounced "Block-us"), designed by Bernard Tavitian in France and now produced by Mattel. Interestingly, Blokus contains the same 21 shapes as Poly-5, in four colors (84 pieces) and uses the same corner-to-corner concept we created in 1979 for Quintillions and included in Poly-5. The very large Blokus grid lets four players compete. This game has had a meteoric rise, proving again the irresistible appeal of these shapes. Mattel has discontinued an online playable version, but you can play a similar style on the Pentolla site. Sites mentioning or showing pentominoes are growing faster than we can keep up with. You can find a wealth of them on Google or other good search engines. Here is a list of the most notable ones we've found. Please let us know if you find any links not working. The Poly Pages by Andrew Clarke are a virtual encyclopedia of polyominoes and all things polyform. Eric Harshbarger explores new aspects and problems on his well-written and handsomely designed Pentomino Page. 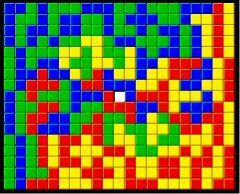 His Enclosed Triplets theme won the Gamepuzzles Annual Pentomino Excellence award for the best new pentomino problem proposed in calendar year 2004. The goal was to find a single 75-square area formed of the 12 pentominoes such that they enclose 3 copies of any one of the 12 where none of the three touch each other. Solutions were found independently by Michael Keller and Aad van de Wetering, shown on Eric's website. Also check out Eric's Pentominic Surfaces of 3D shapes covered with folded pentominoes. They're interactive and turn before your eyes. Very cool. One of the open questions about pentominoes for many years was how many ways could the 12 be made into three congruent planar figures. The same results were found by both Helmut Postl and Vasil Tsvirkunov: 339. Here is a nice page showing all the Pentomino Triplets. George Sicherman has a page on Pentomino Oddities, with elegant solutions and some unsolved challenges. An oddity is a symmetrical shape using an odd number of any given polyomino. This research pursues 7 kinds of symmetry. Now he's also working on hexominoes. His latest challenges build congruent shapes: Pento-Tetro-Tetrominoes. Toby Gottfried has written an applet for solving Blokus puzzles and presents a long list of great puzzle questions to investigate. You can also see an awesome symmetrical solution  Toby managed to fit all 84 pieces into an 18x20 grid with only 4 holes remaining, symmetrically placed, and pieces of the same color all touching only at corners. Then he outdid himself with a 21x17 grid with only one hole remaining and opposite sides symmetrically juxtaposed (shown at right). Awesome! You can play the applet right on his website. Toby also did the program for Pentolla, where you can play a similar kind of game, including tournament style for fans of the game all over the world. A totally delightful polyominoes solving adventure is a RealArcade game, Puzzle Express. It features railroad cars with various blocks around which the player fits pieces arriving on a conveyor belt. When filled, a beautiful picture is revealed. Includes historical and geographic information about the cities you visit. Free download for a trial version, or buy the whole package for a pittance. Cool sound effects, and either leisurely or timed modes of play. Starts easy, gets tougher as you move up through the many levels. We love it! The designers, HipSoft LLC, won Kadon's Gamepuzzles Annual Pentomino Excellence Award for 2005. HipSoft's designers have also produced Ocean Express, where you fill barges with polyominoes from a conveyor belt and score points for how much cargo you can load in how short a time. Their most recent version is Galactic Express, where you load polyomino-shaped packages into interplanetary rockets, with tricky cargo-holds. Check out their fabulous production values and intense family-friendly fun. HipSoft have been creating a non-stop stream of other ingenious downloadable games since 2002. In Belgium a classroom teacher, Odette De Meulemeester, and her students created a web page in 1999 with a series of pentomino competitions. The first challenge was to build a "fence" to enclose the largest possible area. The highest score, 128, was achieved by 18 solvers from all over the planet (as of the end of year 2000). The site offers new competitions from time to time, sometimes adding the tetrominoes, as well. You can work the puzzles right online with their very attractive programs. Sometimes they also create playful themes, like this Christmas picture. Although Odette has now retired, the pentomino projects continue. For their final competition, #50, Kate contributed a special "50" design and prize (shown at right). Click on their "Competition" link. In Los Angeles, a geometry teacher in the TEAMS distance learning program has a webpage, Amy's Electronic Classroom, that has a delightful quiz-filled repertoire, including an 8x8 pentomino challenge. You can solve it right online by first placing 4 blank squares in any order you like, then filling in the 12 pentominoes. While designed for students, Amy's webpage is great fun for all puzzle lovers. Requires Java-enabled browser. Kevin Gong, a senior software engineer in California, has developed downloadable shareware programs (around $12) for both Mac and Windows, to let you play and solve polyomino puzzles on 100 different boards, both solitaire and against the computer. Kevin also likes hiking and photography, writes music and tutors math and computer science. Gerard Putter in the Netherlands has written polyomino solver programs for various platforms and explored intriguing aspects of pentominoes. His latest version is done in Java, and you can watch it work at over 400,000 moves per second. He shows solutions to many new and classic figures up through hexominoes, including the total numbers of solutions for each. David Eck at Hobart and William Smith Colleges has written a pretty Java applet that solves an 8x8 pentomino square with 4 holes. You pick where the holes go and watch it solve. Your browser needs to support Java to play. The applet is free to download, if you'd like to have your own copy. In 1989, Logical Design Works, Inc., a game software company in San Jose, California, doing business as California Dreams, received an exclusive license to use Kadon's registered trademark name, Blockout, for a 3-D computer game using the shapes of Quintillions and Super Quintillions. The pieces could be maneuvered to fill up layers in a pit, or else bury the hapless player. In 1991, LDW contracted a licensing and publishing agreement with another California software firm, Electronic Arts, to use Blockout for an arcade game. When this version went off the market, Thierry Excoffier in France made a version available for Unix, and in December 2000, Stefan Komilev of Bulgaria, an independent shareware developer, adapted it for the PalmOS handheld computer. Stefan's program supported color and grayscale graphics and the whole variety of PDAs by various producers like Palm, Handspring, TGPro, IMB WorkPad, Sony. Jean-Luc Pons, a self-declared addicted Blockout player in France, has created an improved C++ clone of the original Blockout version and offers Blockout II as an open source project for other addicted players. All these versions obtained permission from Kadon to use the Blockout name. 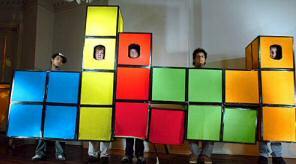 In 2007, Blue Planet Software, sole agent for the Tetris brand, obtained a license from Kadon to use the Blockout name in conjunction with their mobile phone version of 3-D Tetris. It is no longer available. In 2008, the Germany software company, Cosmigo, licensed the Blockout name for a new Nintendo Wii version, but no longer supports it. In 2009, Robb Young, an independent software developer in Connecticut, licensed the Blockout name for the iPhone and iPad versions released originally in April 2010 to Apple's App Store, no longer available. See a YouTube video! In 2014, a young Swiss programmer, Paul Thomann, was licensed to adapt classic Blockout for the Windows Phone (versions 7.5 and up) and launched it in August 2014. It was excellently done. It's a pity Microsoft has discontinued it. As more squares are joined, the number of shapes they make increases enormously but unpredictably. There is no formula to calculate the number of distinct shapes from the number of units joined. One must go through the laborious process of deriving each level by adding one unit to all the shapes of the previous size, in every possible different position. Alternatively, one can work through all the permutations within the various rectangular envelopes, or boundaries, that a number of units touches. (For example, the P pentomino takes up a 2x3 rectangle, the T hexomino needs a 3x4, and so on.) And each process must find and eliminate any duplicates that inevitably show up. So we find there are 5 distinct tetrominoes, 12 pentominoes, 35 hexominoes, 108 heptominoes, 369 octominoes and 1285 enneominoes. Spectacular solutions combining these large-order sets have been found by world-class puzzlers, such as Jack Wetterer and Karl Wilk. See a few of their mega-solutions here. By size 15, the total number of shapes tops 3 million. Such huge sets and their statistics are of only academic interest, not practical as hands-on recreations, and require computer assistance. Many search programs have been written to simplify finding counts and solutions. Here is an excellent one for both 2-D and 3-D solving by Aad van de Wetering (mostly in Dutch; scroll down to the English description and download). Joining cubes in three dimensions is an even more intricate process. The shapes can be rotated into 24 different positions, so duplicates are harder to spot. Four cubes make 8 different shapes, 5 cubes become 29 shapes, 6 cubes jump to 166, and 7 cubes produce 1023. David Goodger has one of the most extensive collections of pentacube figures and solutions on his website, Polyform Puzzler, beautifully displayed. David has also written sophisticated solver programs to track down solution counts. Bob Harris has investigated packing 4x4x4 cubes with combinations of 3 pentacubes/7 planar heptacubes and 3 each of 3 solid heptominoes ("tripling tripled heptacubes") with a monocube hole in every possible position. In 2009, we were amazed by a construction proposed by Jan Zoon of The Netherlands, using four sets each of all the polycubes 1 through 7, plus four sets of the 369 planar octocubes, to form a model of the Notre Dame Cathedral. His first "blueprint" is shown at right, with assembly solutions aided by computer. For over a year, Jan was handcrafting all the wooden pieces for this model. He used a total of 45,178 cubes, with dark and light hues to create a checkerboard effect. With the help of a friend, Jan assembled the entire structure in his garden. We thank him for sending us a photograph and construction details. And for this achievementthe largest polycube figure ever built as of 2011 (Guinness Book, are you listening? )it is our pleasure to name Jan Zoon the winner of the 2010 Gamepuzzles Annual Pentomino Excellence award. Francois LaBelle, as part of his M.Sc. research, created the coolest animated effect of "unfolding" the pentacubes into a single two-dimensional cut-out that then folds up gracefully to form the shape again. He did this for all the polycubes 1 through 4, and for 22 pentacube shapes, omitting the reflected pieces. You can turn them with the mouse to view them from different angles. Programs for solving 3-D figures with polyominoes and polycubes have been written by several individuals. And Aad van de Wetering of Holland has not only written a program but shows some handsome constructions (text in Dutch) on his puzzle-filled website. Kadon produces polyominoes up through size 8 (the 369 octominoes) and polycubes through size 6 (the 166 hexacubes). These are pretty much the upper limits of playability and human endurance unaided by computer. The smaller polycubes, sizes 1 through 4, are available only by special order  the size-compatible Poly-4 supplement for Quintillions. Additional variations can be introduced for the polyomino and polycube shapes, such as checkerboarding. Kadon's Quintachex has a reversible, 2-D, 8x8 checkerboard made of pentominoes (all 12, plus a 2x2 square) with its own very large repertoire of puzzle challenges. A non-reversible embodiment of the Quintachex design is the large and Escher-like Dual Quintachex with its wavy cells. In 2001 a puzzle collector in Germany commissioned Kadon to make a complete 36-piece set of one-sided checkerboarded pentominoes in the wavy Escher style, in dramatic black and white as a wall hanging. We named them Pentachex. Its companion set, in gold and silver frosted mirror, hangs in Kadon's headquarters. We then experimented with a complete reversible set of checkerboarded pentominoes, using holes that go all the way through. Letting pieces be flipped brings the complete set back down to only 24 pieces. It can even be arranged into four rectangles (shown). Hundreds of other checkerboarded polyomino puzzles are catalogued in Jerry Slocum's Compendium of Checkerboard Puzzles. In 1989 Kate Jones created and in 1991 introduced Rhombiominoes, where the squares of the pentominoes have become rhombuses, leading to pieces stretched diagonally two different ways. The 20 pentarhombs fill a 10x10 rhombic tray. An article about them was published in The Journal of Recreational Mathematics, Vol. 24, No. 2, 1992, pp. 144-146, with a follow-up article in Vol. 25, No. 3, 1993, pp. 223-225. Kate also began exploring the 62 hexarhombs, produced in a 20x20 tray, and the smaller, size 1-4, polyrhombs, encouraged by friend and puzzle whiz, Robin King. For the International Puzzle Party in 2006, Kate designed a special set of the polyrhombs sizes 2-4, as the Boston T-Party puzzle. A few years later, in Hungary, Dr. László Nagy also discovered these shapes and has developed a beautiful website, Pentomino HungarIQa, lovingly dedicated to standard and rhomboid pentominoes, in 4 languages. László's set has 24 pieces, with the 12 left-slanted shapes in one color, and the 12 right-slanted ones in a second color. In 1997 Kate designed perforated polyominoes (the Fill-Agree set) with two holes in every possible position. In 2001 Alexandre Owen Muniz ("Owen") commissioned us to produce a limited run of a set of L tetrominoes with two kinds of holes (at right) and did computer research of interesting combinations among the billions of possible solutions. In 2001 Junichi Yananose of Japan created "Holey Rectangle" (at left, unsolved), consisting of 16 V trominoes with two half-circles on their edges in all possible combinations, the goal being to form 16 circular holes. There are 27 complete solutions, although the V's will readily assemble millions of ways with incomplete holes. We were commissioned to produce a limited edition of Holey Rectangle for a puzzle seller in Japan and may add it to the Kadon product line ourselves someday. Other variations on the transformation theme: In 1999 Goh Pit Khiam proposed "squashed pentominoes," where rectangles rather than squares are joined, giving the set a squashed or stretched look (at right). The Soma cube was marketed in rhombic form as Rhoma (at left), originally by Design Science Toys, now sadly out of business. Instead of cubes it had rhomboids, giving the puzzle a dizzyingly slanted look. As of 2012, it appears to be out of production. In 2006, Jyotirmoy Sarkar, Ph.D., a mathematician at Indiana University, produced a hinged set of the 11 hexominoes that can fold into a cube, with a large number of figures to solve, both planar and in 3-D.
Kadon is the world's pre-eminent producer of polyform puzzles for hands-on enjoyment and as a playable art form. In 2007 we procured the Internet domain name, polyformpuzzles.com, as a portal to our main gamepuzzles.com website and to its polyominoes and polyforms sections.